Looking for a quick and easy, but filling meal? In a large saucepan, cook pasta according to package directions for al dente. Drain pasta, reserving pasta water; keep pasta warm. In same pot, cook bacon over medium heat until crisp, stirring occasionally. Add peas; cook until just heated through. Add pasta to pot; toss to combine. Stir in remaining ingredients, adding enough reserved pasta water for sauce to reach desired consistency. If desired, serve with additional cheese. The heat of the pasta cooks the eggs, but they may not reach 160°, the temperature at which they’re considered safe to eat. To prevent food-borne illness, you can use pasteurized eggs. 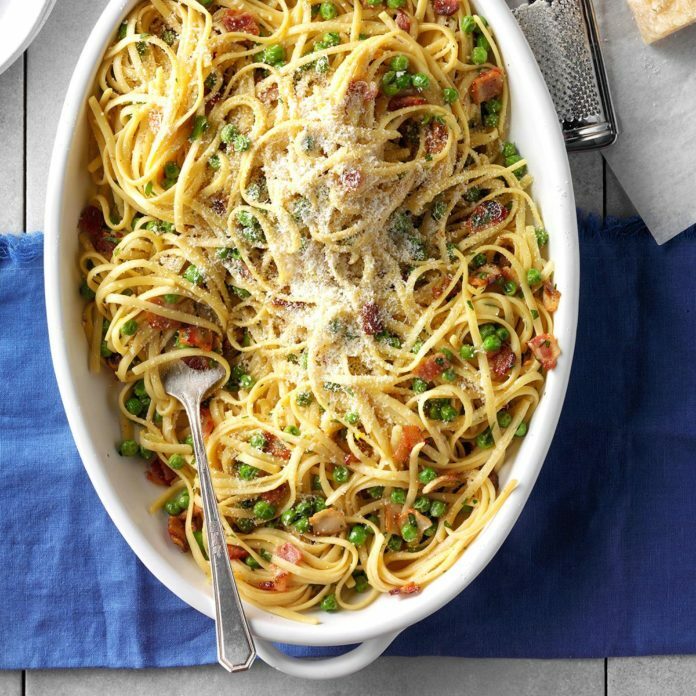 Pancetta is the preferred ingredient of choice for true Italian carbonara but it can be a little hard to find, which is why we called for bacon. If you can get pancetta your carbonara will be all the better for it. 1 cup: 353 calories, 12g fat (4g saturated fat), 65mg cholesterol, 326mg sodium, 46g carbohydrate (3g sugars, 3g fiber), 14g protein.